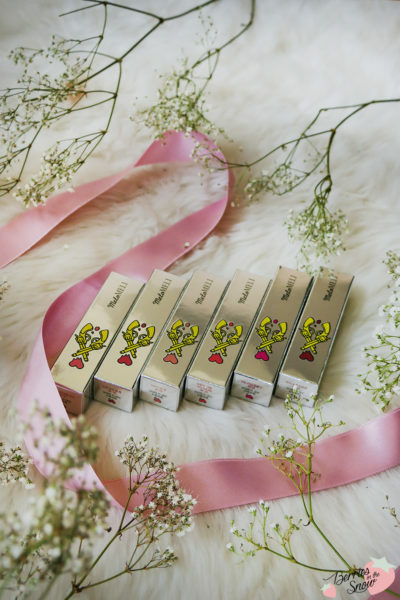 It’s been a long time that I wrote a lip tint review and here I am with a very new Korean beauty brand and all their shades: the MeloMELI Cotton Shot Lip Tint! I was so excited when I received these and started to try and test them out directly. 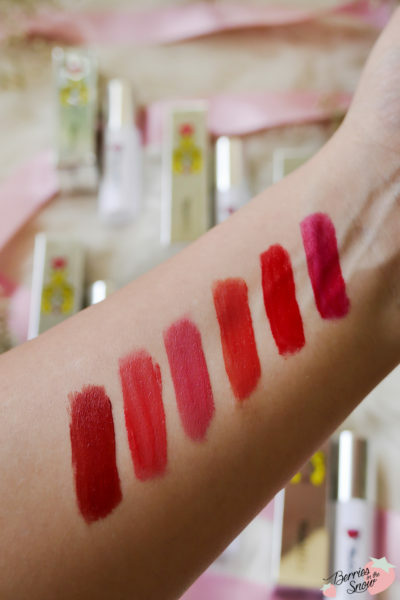 Here is my final impression and all the swatches for the Cotton Shot Lip Tints. Thanks to Beautytap.com for providing me these lip tints for reviewing! MeloMELI was totally new to me before I tried these tints and these were able to capture my attention from the start! The first thing I noted was the adorable packaging design and the signature melting heart. That combination with the crossed colts below the heart is simply screaming “PLEASE BUY ME!”. The design makes a modern and fresh impression, but definitely girly enough to score high in the cuteness scale. The brands name is said to derive from the French word for “mishmash”, which may reflect the inspirations taken from the classic 1960s style revamped with these modern vibes. 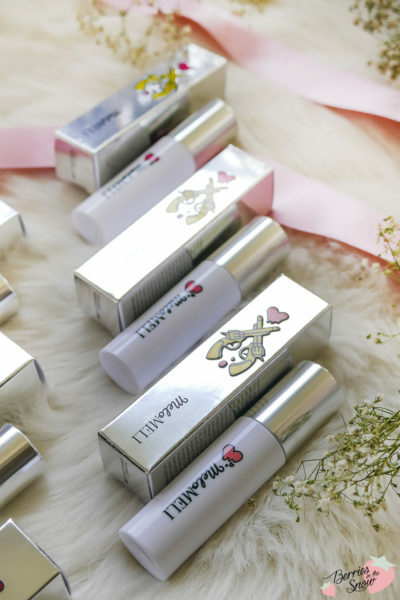 There are currently 3 products available on Beautytap.com for this brand: a Cushion, Matte Lipsticks and these Cotton Shot Lip Tints. The MeloMELI Cotton Shot Lip Tint is a cotton-type tint, with a matte finish, but creamy texture. It is long-lasting, not drying, and has vibrant color pay-off according to the description of the tints. 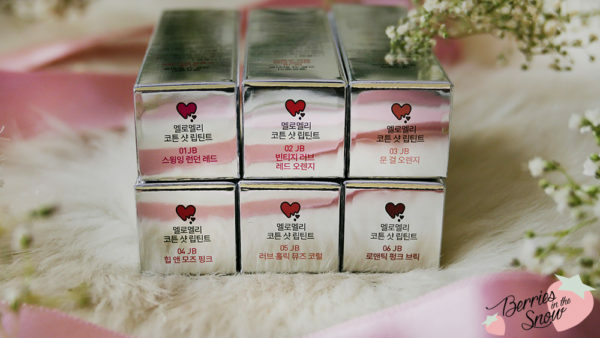 Since it has a creamy texture, but a matte finish it can be used as tint, but also as blush. 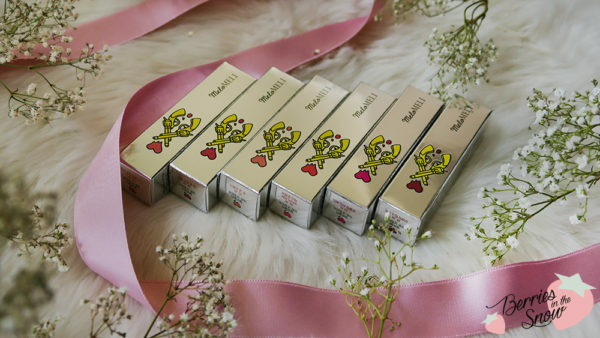 Each of the MeloMELI Cotton Shot Lip Tints comes in a silver cardboard box. The design of the tube of the tints is very neat and minimalistic, with a silver cap and a white body. There is simply the brand name and the melting hard depicted. 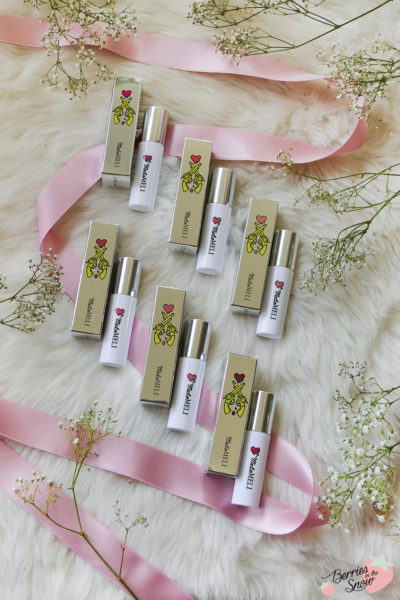 Each MeloMELI Cotton Shot Lip Tint comes with an angled applicator attached to the cap. The application is very smooth and creamy and the finish upon swatching is moist and glowy first. After a while the tint dries down and transforms to a matte and cotton-like texture. 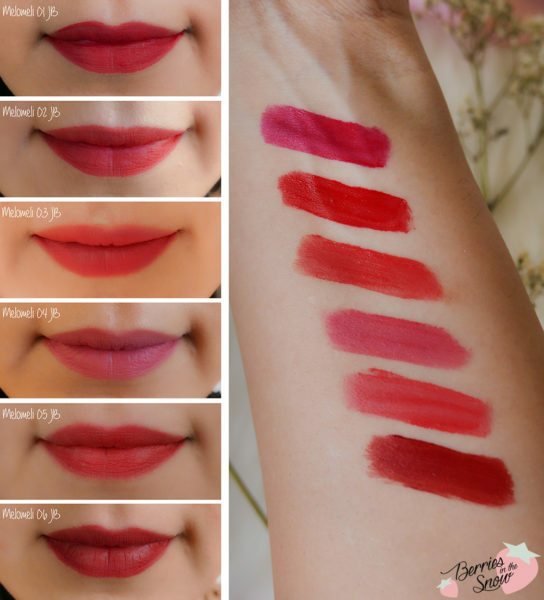 It reminds me of the Peri Pera Ink Velvet Tint that I showed in my post for my Beautytap.com for 11.40 US$. While swatching these I already discovered how pigmented these tints are. And all the shades really look different on my skin, too! Upon applying these lip tints on my lips I was even more surprised that all of the colors seem to show on my lips. 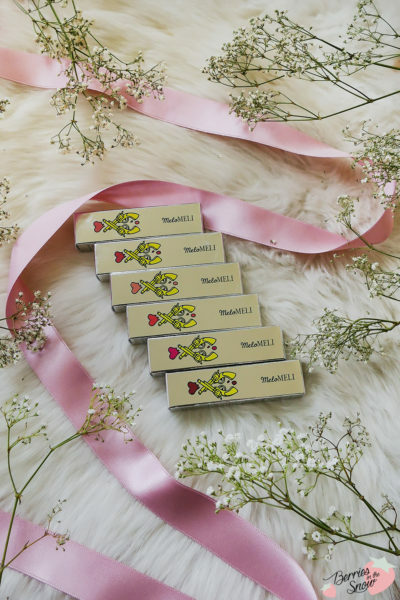 Usually, I have problems with brighter shades, because they don’t show on my natural lip color, but the Cotton Shot Lip Tints from MeloMELI are so vibrant, that there is no way that they don’t show off. You can also apply them either very lightly for a natural tint, or more vibrant and opaque. I have to point out that they don’t feel drying on the lips AT ALL, despite their matte texture. The staying power is not ultimately long, so it will fade after drinking and eating, but it fades very naturally and nice, so you do not need to check the mirror right away after eating lunch. I have to say that I love these tints, and they feel wonderful while wearing them. I love the shades, too, especially shade 03 and 04, which are nice every day colors, but especially the brick-red shade 06! It looks so beautiful and I’m definitely in love for it. If you love tints you will not regret getting one of these beauties for yourself. I was really happy and impressed with the cotton shot tints. 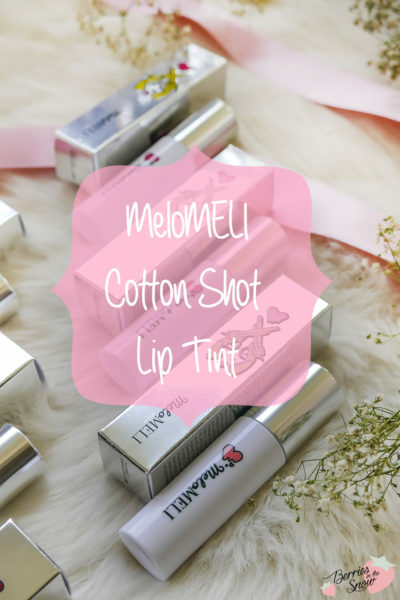 The MeloMELI Cotton Shot Lip Tints are available Beautytap.com for 11.40 US$. You can use the code BERRIESSUMMER for 15% off non-sale items! 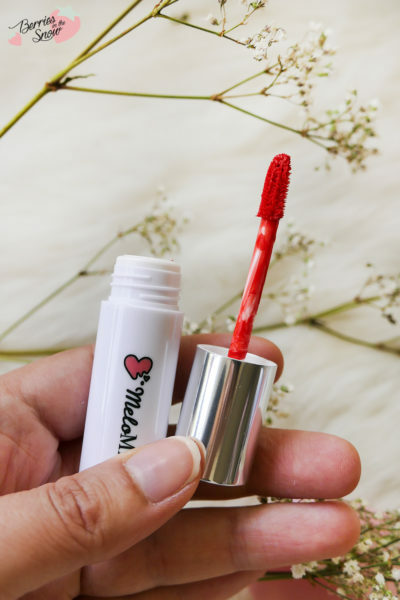 Have you tried these tints from MeloMELI, or heard about this Korean brand already? Which shade do you like most? Ohh, why not?! I think its cute :D But the colors are what’s important after all, right?! 06 ist definitiv eine wunderschöne Farbe! Die Farbe finde ich auch richtig schön, aber all die Tints sehen toll aus, muss ich sagen. Ich bin sehr begeistert! Das Packaging ist ja so süß! Mir gefallen auch die intensiven Farben echt gut daran. Vielen lieben Dank. Ich kann wirklich nur zustimmern. Und sie fühlen sich toll an auf den Lippen. Die Marke kannte ich noch gar nicht. Die Verpackungen sind aber so toll. Ich finde die Farbe 04 am schönsten.